The United Media Guild’s public campaign on behalf of State Journal-Register members is continuing on multiple fronts. The UMG has been negotiating a first contract at the newspaper for three years. Many veteran journalists at the newspapers have gone eight years without a raise. In its latest offer, GateHouse Media essentially offered a pay cut — since its offer included no raises and increased health insurance costs that would far outstrip the modest signing bonuses. So the battle continues. 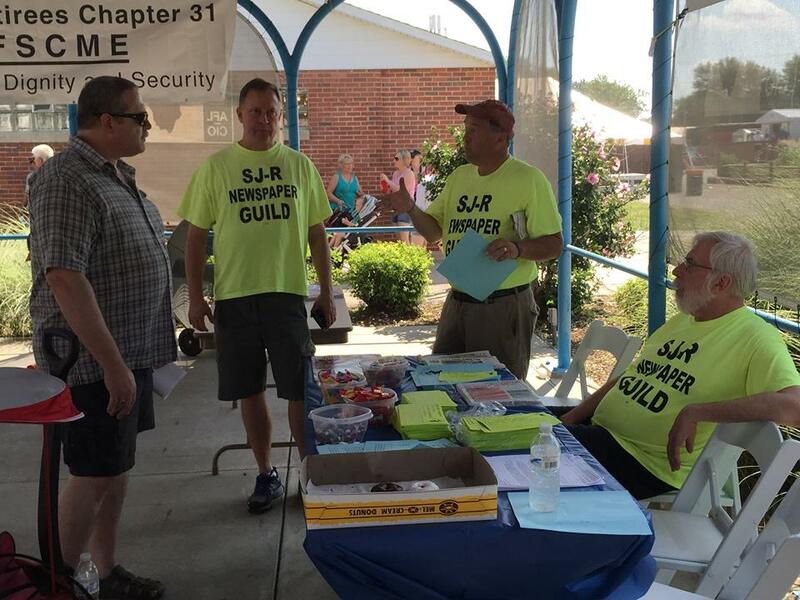 Once again our members manned an informational table at the Illinois State Fair. They chatted with hundreds of disgruntled readers of the State Journal-Register and other newspapers that suffered drastic cutbacks under GateHouse ownership. Many of those visiting our tables had heard our radio advertisements that played on several Springfield stations earlier this year. UMG business representative Shannon Duffy started meeting with major SJ-R advertisers in Springfield to explain what has happened to the newspaper under GateHouse ownership. Earlier the National Labor Relations Board found merit in our Unfair Labor Practice charges against the State Journal-Register and GateHouse Media. Company managers (among other things) videoed our members during an informational demonstration outside of the newspaper building — which is a protected act under the law. An investigation by the NLRB verified our complaints of unlawful surveillance of employees and creating an atmosphere of surveillance in the workplace. The company accepted this finding without appeal. It will post notice of its NLRB violations in three places in the building. On another front, officials from 10 major unions and labor organizations — including the Illinois Education Association, AFSCME Council 31, the Illinois AFL-CIO and police and firefighter unions — wrote a letter to the editors of The State Journal-Register and Illinois Times calling on GateHouse to work out a fair contract covering Guild members in the SJ-R newsroom in Springfield. The UMG thanks these labor leaders for supporting good journalism as an essential component of a stable democracy. This show of support is bound to ripple throughout the community, and it should be a strong indication to GateHouse Media officials in New York that the general public values quality journalism in the capital city. Readers of the paper far and wide don’t want to see GateHouse siphon the lifeblood from the The State Journal-Register in the name of profit. Readers already have seen printing of the paper outsourced to Peoria and page design outsourced to Texas while a steady stream of talented staffers either left the paper or were shown the door. Readers want to see profits generated by the SJ-R’s remaining hard-working employees spent on more than lavish bonuses for top GateHouse officials and the acquisition of more newspapers. A good first contract with newsroom employees would bring stability for workers and readers alike. Since Abraham Lincoln’s time, Springfield residents have relied on local newspapers to provide information and insight about local and state matters. Because Springfield is home to state office holders and their staffs, these newspapers had substantial influence on the debate of issues affecting all Illinoisans. The State Journal-Register (SJR) is the last daily paper standing in Mr. Lincoln’s hometown and it is crucial the SJR remain viable, employing first-rate journalists and presenting high quality news and analysis. To achieve that goal, there must be a fair settlement of the contract between Gatehouse Media, owner of the State Journal-Register, and newsroom employees represented by the United Media Guild. For more than three years, the employees have been trying to negotiate a contract to allow the SJR to continue to publish a high quality newspaper and, over time, boost circulation to the point that reporter positions eliminated since Gatehouse bought the paper can be restored. Many of these employees have logged decades of service to the SJR and its readers, remaining loyal despite Gatehouse’s elimination of the copy desk and other important newsroom positions. We urge everyone who believes a great city deserves a great daily newspaper to call the publisher and insist that the SJR negotiate a fair contract with the newsroom employees. You can reach Publisher Clarissa Williams at (217) 788-1326. Finally, our members will once again have a strong presence at Springfield’s Labor Day Parade. Last year UMG’s Springfield unit served as Grand Marshal of the parade.